What Made This Tree Fall Over? 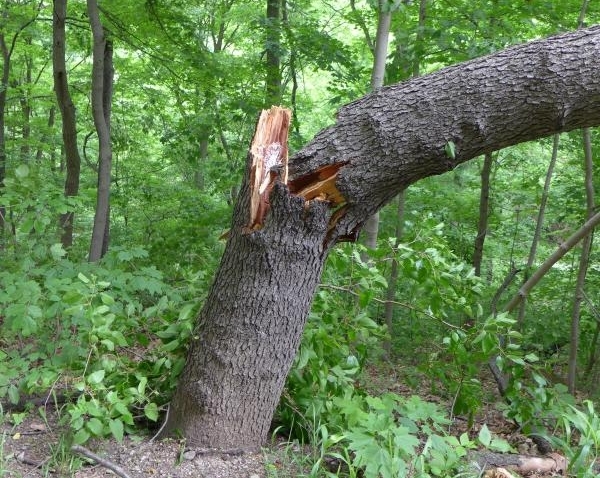 When I see a tree snapped in half like this I have to ask: What made this tree fall over? It was alive when it fell. 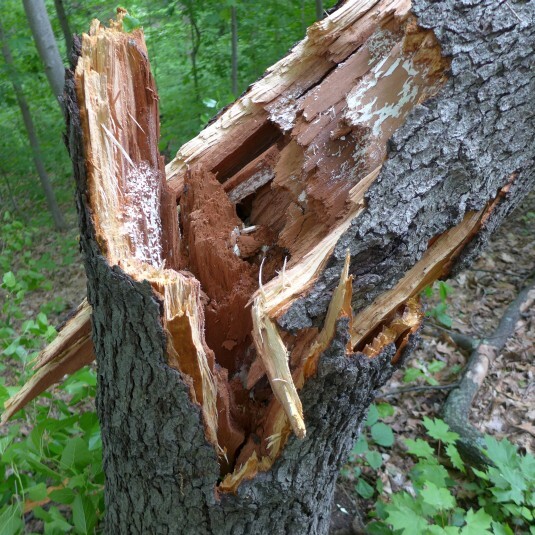 It grew leaves this spring so the structural weakness wasn’t evident until the tree broke. This is the only broken tree at this location in Schenley Park. Even if a strong wind snapped the trunk it wasn’t strong enough to damage other trees. The trunk is not hollow inside the break though there are air gaps between the light outer wood and dark inner core. 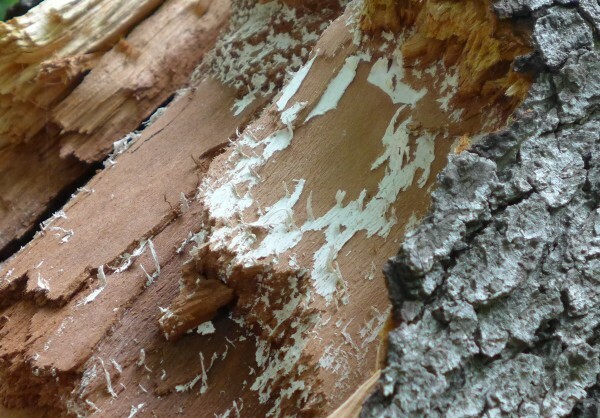 There’s a white flaky fungus inside the trunk that coats the light wood layers. Did the white stuff weaken the trunk? Is it responsible for the break? Here’s a close look at the white flaky fungus. It reminds me of the white correction tape I use on paper. What do you think? Is this the reason the tree fell over? Leave a comment with your answer. UPDATE with the answer! The white fungus is a species of Armillaria or honey fungus. (See Maureen Hobma’s comment below.) I wrote about Armillaria on 16 January 2014 because it’s the largest living organism. Up until now, I had only seen Armillaria‘s black rope-y strands and honey mushrooms. The white fungal sheets are newer growth, the mycelium. It can be bio-luminescent! I learn something new every day. Not sure about this, but could it be heart rot? This would cause damage to inside of tree and a good strong wind would bring it down. trees cut down & we were amazed that all of them were hollowed out bec. carpenter ants are extactly what they say, they eat wood and the wood cutters told us that future storms would start to blow these over and damage the house of course. But I do not remember whether the insides had that white paper look. That is interesting though to see why these fell. It’s clearly a fungus hence the white hyphal structure. Looking at the center of the tree you can see that it broke off without lots of fibrous material tearing. That indicates that the wood structure has been digested thoroughly leaving it with no strength. Even tho there was woody material in the center of the tree it was structurally hollow. The white fungus hyphae material is kind of neat. Once pulled a letter paper sized sheet off of a fallen hemlock that had severe ring separation allowing the sheet to form a large continuous expanse. Tom P, do you know what kind of fungus it is? Wish I knew! Kate, I suggest you send this to Sandy Feather at the Penn State Extension office. I’m sure she would have an answer for you! Call your County Extension Agent, and see if you can email the pictures to him/her. They should be able to tell you, as part of their training is tree/plant diseases. Good pictures! I am at the CDC for a fungus workshop, I will ask the experts tomorrow. I will let you know their answer. Maureen, that’s so cool! Looking forward to the answer. Thanks, Maureen. See my update — with the answer — at the end of the blog.